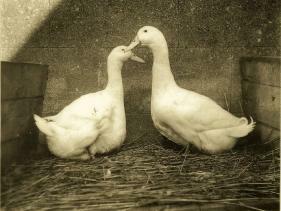 About Us - Richard Waller is the last remaining breeder of Aylesbury Ducks. Richard Waller the last remaining breeder of Aylesbury Ducks. This breed of duck has been kept by the family since 1775. The ducklings are bred on farm, and sold along with other varieties of free range birds – chickens, geese, white and bronze turkeys, and traditional capons. We are a small family-run business based at Long Grove Wood Farm that is situated in ancient beech woodland overlooking the Pednor Valley on the outskirts of Chesham, in the midst of Buckinghamshire's Chiltern Hills. It is here that we produce our now famous real Aylesbury Ducklings and other free range poultry. We hope whilst visiting the various pages on our website that you will appreciate the care and attention that we lavish upon ourlivestock, along with high welfare standards. It has been a long held family belief that the welfare of your birds should be a priority and that their needs should come before all others. This is as true today as it has ever been. With the exception of our Aylesbury Ducklings, which of course are bred and hatched by ourselves, all other poultry is purchased as day-old from reputable and well-known hatcheries to be reared till ready for the table. To alleviate stress all final processing is carried out by us on farm. We trust you will enjoy reading a brief history of our family and the details of the poultry we rear and sell. We would be more than happy to answer and questions or queries you might have by using the contact page.